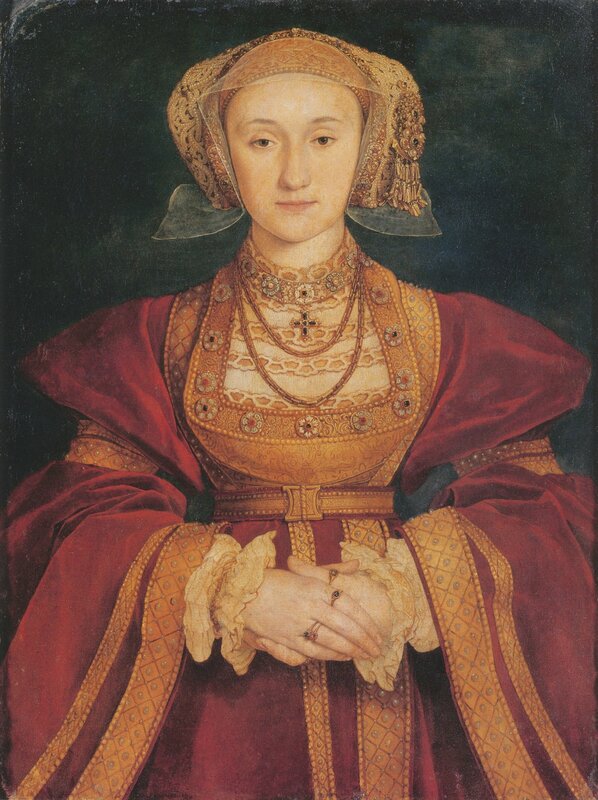 Anne of Cleves was arguably the luckiest of Henry VIII’s six wives. Had she been less agreeable, she could have found herself facing the executioner’s block, but instead she led a happy life of luxury and privilege. When she died on July 16, 1557, it was as the late King Henry’s “beloved sister” and one of the highest ranking and most beloved ladies in England. Anne of Cleves was the fourth wife of Henry VIII. She was definitely not his first choice for the job. But since Henry’s marital track record was so poor (one wife tossed to the curb, one executed, one supposedly allowed to die to save the heir she was birthing), the eligible royal ladies of Europe were hardly jumping at the chance to be the new Queen of England. There were also political and religious issues to be considered. Henry’s break with the pope years earlier had alienated him from the powerful Catholic countries of France and Spain, and they had joined forces against him. The King’s chancellor, Thomas Cromwell, was a staunch Protestant. He believed a match with a princess from a Lutheran background would give England a much needed ally on the continent – and further the Protestant cause at home to boot. Cromwell found a likely prospect in the small German duchy of Cleves. The Duke of Cleves had three sisters, and Henry sent court painter Hans Holbein to paint portraits of them in 1539. He was quite taken with the likeness of 24-year old Anne. He fell madly in love with the idea of being in love and two months after laying eyes on Holbein’s painting, the marriage treaty between King Henry VIII and Anne of Cleves was finalized on October 6, 1539. When Anne of Cleves arrived in England, it was obvious from the beginning that the marriage was going to be a disaster. They were both staying at Greenwich Palace over New Year’s 1540, and when Henry could no longer control his impulse to meet his bride-to-be, he burst into her chambers unannounced in one of the disguises he loved so much. Poor Anne of Cleves had no clue who this overweight oaf was and was watching the bull-baiting going on out in the courtyard, so she pretty much ignored him. Henry was not expecting this lukewarm reaction. He was quite put out that he had to don his Kingly garb before Anne recognized him and bowed and scraped like she should have in the first place. How embarrassing. “I like her not!” was his first impression of his future wife. The feeling was probably mutual, but Anne was in a much more vulnerable position. Unable to speak the language and at the mercy of a despot who had instantly despised her for no rational reason, things did not get off to a great start for Anne in her new home. Henry wanted out of the marriage before he was even in it, but there was no way to bail without causing an international incident. He told Thomas Cromwell, “My Lord, if it were not to satisfy the world, and my Realm, I would not do that I must do this day for none earthly thing.” So, On January 6, 1540, Henry married Anne, and things went from bad to worse. The solution ended up being easy. Since Anne briefly had a pre-contract to marry the Duke of Lorraine when she was 12 years old, her marriage to King Henry was legally invalid. There had been no official dispensation releasing her from the pre-contract, so she was still technically betrothed to the Duke. How convenient for Henry! To the King’s great surprise, Anne quickly agreed to end their marriage. Perhaps she didn’t consider him any more of a prize package than he did her, or she was smart enough to realize resistance was futile and if she tried it might all end in her head on the chopping block. Since she didn’t put up a stink, Henry was very generous, providing Anne with an ample annual income and vast amounts of property including Richmond Palace and Hever Castle, the former home of Anne Boleyn. She was also given the status of the King’s sister, second only in rank to Henry’s future wife and daughters. Not bad. She continued to do so until her death at age 41 on July 16, 1557.